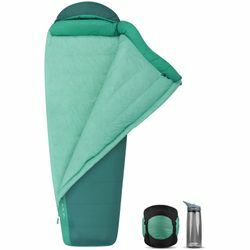 Sea to Summit Journey JoI 30 Sleeping Bag. The Journey™ women’s down sleeping bag is equally at home on trails or traveling the world. Two zippers allow you to increase ventilation or open the Journey completely flat like a comforter, and the quality down will keep you warm and snug in cooler temperatures. Shaped to match your natural sleeping position for comfort anytime, and light enough to carry anywhere. IS THIS WOMEN'S DOWN SLEEPING BAG…? Warm enough for cool weather camping or travel? Yes. The quality down, cozy hood and extra Thermolite® insulation in the foot box keep you warm. You would probably choose the 18°F model which has a draft collar – pair it with a high R-Value sleeping mat like the Women's Comfort Light Insulated.